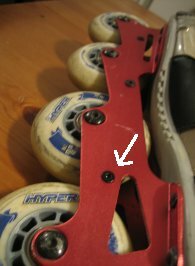 My skate chassis was missing a screw. Two of them to be exact. I’m not talking about the ones that act as axles for the wheels, I mean the ones that hold the chassis together. I looked all over for a replacement, but didn’t come up with anything. I measured the screw and found it was 10mm long, flat head style, with a hex drive of 2.5mm. The diameter I had to guess on, but luckily I got it right. The size was M4. I ordered a dozen of them online for a couple bucks plus shipping. I swear, bolts fall off inline skates all the time and they are usually a pain to replace. So now if it ever happens to you, you’ll know what to get. Oh, just FYI this was on a Bauer Tuuk chassis, but I checked a Mission HiLo chassis I had and the bolt was the same. The head had a diameter just a tiny bit bigger than OEM but it didn’t seem to make any difference. This entry was posted on on January 19, 2011 at on January 19, 2011 and is filed under equipment, roller. You can follow any responses to this entry through the RSS 2.0 feed. You can leave a response, or trackback from your own site. Thank you! I've been looking for what the hell these screws are for a while now, man, you're a life saver. Thanks again! I ended up calling Mission when that happened with mine. I asked if I could order screws and they sent me a whole new chassis for both skates for free! Not saying that would happen with everyone…just another avenue to take. Glad to know the size of the screws…thanks for the info!